A Dominant, Kinder, Gentler Meade? All of the more advanced Meade telescopes including their ETX-90 EC, ETX-125 EC, LX90, LX200 and other models are manufactured at the Meade Irvine factory. Smaller telescopes, such as Models DS-60 EC, DS-70 EC, and DS-114 EC, are manufactured under exclusive license to Meade designs at their affiliated factory in Taiwan. In either case Meade onsite quality-control engineers trying to assure that every telescope that bears the Meade name meets the desired objectives of its type and price class. To understand Meade Instruments Corp. one must come to know something about John C. Diebel, the founder and the driving force behind Meade Instruments. He later sold the company staying on as an employee for a couple of years, the later came back to buy the company, and a few years later then took it public. Today he remains the Chairman of the Board and CEO of Meade Instruments. John is definitely "type A" and nothing less. He is astute and competent, has developed a plan, and maintained and a vision focused to put Meade at the top of whatever it does. This drive is also a part of what has caused Meade to get a reputation in the astronomy community not only as an innovator but also as a big corporation with a big corporation approach to be reckoned with. Almost every decision made by Meade management in our experience has had John's mark on it. John is among the dozen or so most influential persons in the past 50 years in the advancement of telescope design, and in making them available to the consumer. It was his 1990's leadership in developing and mass marketing easy to use, economical "go to" telescopes to the masses that has demystified the hobby and made astronomy accessible to many people who would otherwise never have bought a telescope. These less costly telescopes and their other more complicated models may have been prematurely rushed to market (particularly in the early 1990's when John Diebel was not at the helm) cost Meade some loss of credibility among the more experienced amateur astronomy community. However, one can not argue with the sales statistics. Meade has produced more of what the public wanted - and has done it better (for their portion of the market) than anyone else. With the slowdown in the U.S. economy since year 2000 Meade has used the time to improve the products they make now, and make the acquisitions that will be their springboard into other markets too. They are a wiser company now, and seem to appreciate what they have done well, and what they can do better. Like most youngsters of his day John Diebel became attracted to space and astronomy. By the eight grade he built an astronomical telescope for his school science project. This school project drove his interest further in astronomy which, when combined later with his understanding of engineering, and an entrepreneurial spirit ultimately lead to his establishing Meade Instruments. John received a Ph.D. in electrical engineering from the University of Southern California in 1972. 1972 John was a 26 year old engineer working in radar development at Hughes Aircraft Company when he obtained a credit union loan to order a $2,500 selection of amateur telescopes from a Japanese manufacturer and wholesaler. His simple business plan succeeded as he resold these telescopes at prices ranging from $49 to $235 each through advertisements in amateur astronomy magazines. After six months, John was netting $300 per month, enough to quit his engineering day job. Starting quite literally on the kitchen table of a single-room apartment, and operating from a post office box, the one-person business grew slowly. His sales in the first year were just under $8,000 all of which came from a two by four inch advertisement which first appeared in the July 1972 "Sky & Telescope" magazine. At that time S&T was the only wide-circulation US publication directed at the amateur astronomer. John persuaded his father Herb to come out of retirement to help him establish and run Meade Instruments which he founded in Costa Mesa, California. John Diebel once explained that he came up with the name Meade for a possible new venture while working at Hughes. He was thinking of Lake Meade and the name sounded easy to say, looked good in a heading, and settled well with him. The name of the company was originally spelled "Mead", and it was another engineer at Hughes who suggested John add the "e" to make it Meade. In 1973 John introduced a selection of 0.965" (Japanese standard), 1.25" (American Standard), 2" eyepieces under the Meade name. These were generally of good quality including Kellner designs, and would come to include a series of very high performance ("Research Series") Orthoscopic and Erfle 1.25" and 2" designs. Meade also introduced their line of telescope components including viewfinders, rack and pinion spring loaded Focusers, and camera adapters. These accessories often were equal to if not superior to alternatives of the day. About this time, the black and white "4M" logo was designed for use by Meade Instruments. This logo uses the four M's arranged where the base of each letter meets, with a star burst in the middle - it gives a feeling of something astronomical. In 1975 Meade Instruments became incorporated in Delaware. This is not an uncommon practice for U.S. based companies, even those located outside of Delaware because that state has made it a relatively simple and less costly process than most other states. 1977 John did more than import and resell telescopes, he developed a good working relationship with his Japanese partner and became involved in developing custom focusers and accessories that gave the Meade products an edge in the U.S. market. 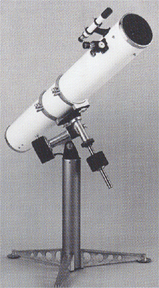 By 1977 Meade Instruments offered a broad range of telescope accessories and parts for the serious amateur astronomer. They were shipping out of 721 West 16th Street in Costa Mesa, California 92627. 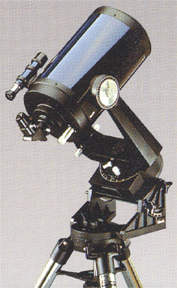 While as late as 1978 Meade still offered a 6"f8 Model 591 Newtonian Reflector with a motorized German Equatorial Mount, Meade now provided a range of accessories and parts for telescopes that in fact permitted the company to introduce its own in-house manufactured telescopes; the Meade 6"f8 (Model 628) and 8"f6 (Model 826) Newtonian reflecting telescopes. A number of new hires came with good experience from other telescope making companies including "Cave Optical" and "Coulter"; these people knew how to make good reflectors. And this is in part why the Meade's of the day in some ways bear a close resemblance to the predecessors. Several of these new hires remain with Meade in 2003 (when this article was written), this demonstrates an uncommon degree of employer and employee loyalty by recent American standards. Left: Meade Model 628, 6"f8 Equatorial Reflecting Telescope, 1977 (62,679 bytes). This telescope is such a refined example of the classic Equatorial Newtonian telescopes sold in the 1960 to 1980's era that Company Seven maintains a lovely example of the last production 8 inch f6b version (Model 826C, discontinued Dec. 1991) in our collection and on display in our showroom. With Meade reflectors American amateur astronomers found that they had, really for the first time, a telescope manufacturer that provided a quality product at a reasonable price, that continually updated its products technically, and above all, one that stood firmly behind every sale. By early 1978 the success of the reflecting telescopes was so great that sales grew to cause a six month backlog even though deliveries were originally promised in "6 to 8 week delivery"! As an example of John Diebel's ethic, Meade wrote letters to each customer who was waiting for their telescope apologizing for the delay, and offering a full refund; no customer canceled. By working the staff overtime, Meade was able to reduce the 6 month backlog to 3 months. 1980 In order to get more people to advance in the hobby, a more portable and intuitive alternative to the classic equatorial Reflector had to be made available and in 1970 Celestron International developed the answer of the day with their introduction of the C-8, an 8" f10 Schmidt-Cassegrain telescope (SCT). By 1977 John could see the market demand was growing rapidly for the more complicated to make, yet compact and intuitive fork mounted SCT. Up to this time only one Celestron had succeeded in mass producing good quality SCT's even though two other companies tried - and failed in their efforts. Regardless, after a three-year research and development effort that required all of the engineering and financial resources that Meade had at its disposal, their Model 2080 8" Schmidt-Cassegrain telescope was announced in September 1980. This product introduction marked a landmark accomplishment at Meade in telescope production for the serious amateur. Throughout this period Meade sold their telescopes directly to customers by mail through "Crown Optics", but in time as more retailers were established to offer Meade products, Crown was discontinued. Each year thereafter would see new and exciting telescope models and accessories (often as Meade and Celestron would leapfrog each other) as Meade came to eventually lead the way in SCT technology for the serious amateur. The Meade telescopes of the 1970s and early 1980s were well regarded and provided a good value. But these were basically Meade's version of existing proven telescopes, or were imports from Japan made by Carton and others. The Meade 626 and 826 series Newtonian were close to the 1960's Cave and Criterion Dynamax designs - but then how different can one Newtonian be from another? 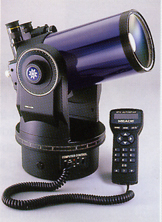 The Meade 2080 Schmidt-Cassegrain introduced in September 1980 was their version of the 1970 Celestron C-8. To their credit Meade did look for ways to improve upon the predecessors, and Meade products came to be characterized by having a more polished and professional appearance. The Meade Newtonians incorporated superior components, and the Meade 2080 fork mount and tripod provided rigidity superior to that of the Celestron C-8 of the 1980's. Meade was the first to provide their SCT with a worm gear (LX) drive arrangement instead of the spur gear drive used by Celestron. The worm gear would become the standard for all production SCT fork mounts. Meade accessories came to look like well engineered solutions, as opposed to having the "after thought" appearance and reliability of many accessories offered by competitors. For example look at how well engineered the optional Meade Declination Drive Motor and the Counterweight Bar for the Meade SCT was compared to that offered by Celestron at the time. Meade designers sought to make more and more of their accessories interchangeable among Meade telescopes; the same Declination Motor for the Meade 2080 would come to fit their Model 2120 10" SCT, and was used with little change in their German Equatorial Mounts of the 6 to 16 inch Newtonians. Through the 1980's the sales of Meade SCT's grew rapidly as did the overall demand for these advanced, relatively compact and user friendly telescopes. Meade showed its efforts had been focused not only on an 8" SCT but on others as well. Meade soon introduced the Model 2044 a 4" f10 SCT, and the Model 2120 10" f10 SCT to round out the product line. The 2040 would become the basis not only of the compact fork mounted Model 2044 astronomical telescope, but being removable from the Fork Mount it was useable as a astronomical photo-guide telescope and terrestrial spotting telescope. 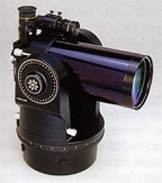 A new spotting telescope similar in appearance to the 2044 was their "de tuned" 4" catadioptric employing a Gregory-Maksutov design; it was the only production Gregory we knew of. The compact SCT's of Meade and Celestron would become largely responsible for the demise of similar aperture Newtonian telescopes including the Meade Model 826 series and Research Series 10" and 12-1/2" offered by Meade Instruments up through the early 1990's. By this time, Meade was starting to exude a degree of professionalism in certain areas that was uncommon in the industry. Their telescopes for the most part looked professional, an appearance that inspired confidence and pride of ownership. Meade already produced the most incredibly informative, beautifully laid out and printed catalog describing their entire product line. This characteristic of the company's marketing practices continues through today. Meade should arguably charge a fee to the customer for that catalog since it is so informative and beautifully illustrated. Their advertisements exuded similar professionalism, in stark contrast to some of their competitors of the day. The high tech innovation that Meade would become known for had yet to appear as the infrastructure of the company was being cemented into place. Meade and C-7 Meade Instrument Corp., their founder John Diebel, and the late Herb Diebel hold a very special place in the history of amateur astronomy, and they had more than a little to do with the beginnings of Company Seven Astro-Optics Division's consumer side. Several hundred years ago when Company Seven first explored the possibility of offering consumer telescopes our first product line became Meade Instruments! 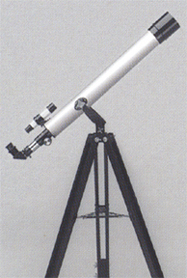 By 1982 Company Seven became interested in offering a well integrated product line of Schmidt-Cassegrain telescopes. The Meade product line struck us at first glance as having a good selection of 4" to 10" aperture models, each with a distinctively professional appearance, and uncommonly well supported with nicely engineered accessories. But it was Meade that have first approval to the budding Company Seven, with their foremost competitor (at the time the market leader) Celestron following a year later. At that time Meade was still the underdog in the industry, lacking the size and reputation of its competitor. Our staff developed a great working relationship with Meade, in good measure through the the help and kind understanding of Herb Diebel, the head of Meade's Service Department. If we needed a repair part Herb often had it in our hands from California the next day! Throughout the 1980's Meade did not enjoy the reputation for superior optical quality that Celestron did, this is the most difficult aspect of manufacturing. However, the Meade Instruments Corp. of the 1980's started to distinguish itself with innovation. By 1984 Meade introduced their LX3 Drive System, a Quartz 12 volt DC drive system with drive corrector which was incorporated in their 8" and larger SC telescopes, and later on in their Schmidt-Newtonian telescopes. We believe the LX3 capabilities, combined with the well integrated system of superior Field Tripod and other accessories was more advanced than anything we could obtain from Celestron at the time. Celestron had in fact dramatically increased production and lost much quality control as the Comet Halley visit of 1985 approached. With the increase in our sales, we came to find increasing nuisance instances of missing parts or instruction manuals. So Company Seven instituted our first in house quality control program. As we inspected more and more new telescopes that arrived from all sources, we observed the quality control tended to vary at Celestron more so than Meade. And management at Celestron had done simply stupid things to some telescopes in order to make their marketing more attractive - anyone remember "Star Wheels"? - need we say more. By the time of Comet Halley's visit peaked, Company Seven was selling only Meade SCT's in the 4", 8" and 10" aperture range. Over the Comet Halley era Meade did seem to pass Celestron in raw engineering ideas in those areas where the two companies competed. Celestron might develop "PEC - Periodic Error Correction", then Meade would leapfrog Celestron with something else. Overall this was all quite exciting and beneficial to the astronomy community. But as Meade sales grew, and particularly later on after Meade Instruments was sold in 1986, Meade made some hard decisions which are probably routine in corporate America. And we began to develop a sense that Meade was becoming something other than that which our small astronomy community was used to seeing. "Mine is better than yours..." One of the first prominently ugly episodes in the business side of amateur astronomy happened in 1985 when Meade took the TeleVue eyepiece concepts and designs which were available at the U.S. Patent office and then arranged to have the entire TeleVue eyepiece product line essentially mimicked one for one at a factory in Japan. The external similarities of what would be marketed as the Meade "Series 4000" were obvious: for TeleVue Nagler 4.8 mm, 7 mm, 9 mm, 11 mm, 13 mm Nagler Meade introduced 4.7 mm, 6.7 mm, 8.8 mm and 14 mm "Ultra Wide" (which ironically is the title of the Nagler Patent). Similar duplication of the other TeleVue oculars by design concept, and focal length were done from the 7.4 mm Plossl up to the 55 mm Plossl (where Meade claimed a 56 mm), and the TeleVue "Wide Field" series. And for every proven performance specification published by TeleVue, the many pages of Meade product advertisements claimed an improvement. Regardless of Meade's marketing efforts, the experience at Company Seven was that given the choice the amateur astronomy community generally preferred TeleVue. To some degree this was a loyal response to Al Nagler who is perceived as the true innovator and a fellow observer even through the Meade oculars are still quite good. The TeleVue episode began a series of events that to our small business mind were unsettling. About this time the aggressive reputation Meade began to become established; they became known as a bullying, litigious organization. The perception remains to this day, and is reenforced by the recent bitter history of litigation and troubled business partnerships between Meade and others. These events often come to mind overshadowing the positive experiences and accomplishments. One can argue that litigation is simply a means whereby a corporation asserts its rights, but most people in the USA know the justice system often has little to do with justice - it is often more about clever "lawyering". Selling High By 1986 Meade Instruments was generally acknowledged as the largest manufacturer of beginner to intermediate astronomical telescopes in the world. And by the this time Meade Instruments Corp. must have looked like a very good acquisition target to any stock market analyst who had no amateur astronomy background. By 1986 the sales of astronomical telescopes had skyrocketed (thank you Comet Halley), the future of man in space seemed more assured after being in limbo since the Apollo days, and Celestron was being eclipsed by Meade. We at Company Seven think this was a great time to sell a telescope or a telescope manufacturing company, since we knew sales would be certain to dip or slowdown after the market had probably become saturated. It was then that John Diebel sold Meade Instruments for $6.5 million to a St. Louis based firm Harbour Group Investments, L.P., a leveraged-buyout company - probably with no amateur astronomer on their Board. John Diebel stayed at Meade for two years to facilitate the transition as President, then he resigned to enjoy life. He probably saw signs under Harbour Group management as he had when working for someone else his previous engineering jobs, that once you work successfully for yourself it becomes difficult to work under someone else - even more so if they lack your understanding of your company and market. No Safe Harbour Both Meade and Celestron came to focus more on developing relationships with the larger volume retailers, and mall chain stores. This makes some good business sense, particularly when selling the less costly "department store" variety telescope store. But it alienated some specialty shops, Company Seven sensed our importance to Meade and Celestron was diminishing. We also sensed the quality control and optical consistency at Meade and Celestron were plummeting as new products were rushed to market, and production numbers rose. Meade management seemed to have developed a skill at advertising a new product, usually claiming it would be notably superior to something already on the market and sold possibly at a lower price - and then the product would not be made, or was rushed to market with very bad results for both Meade and its customer. We observed the announcement of the Meade LX4 telescopes in the late 1980's with the line drawing ads that appeared - while some samples were assembled at Meade no LX4 was ever actually sold; this did not stop a prominent New York mail order house from advertising "in stock now" for some time. Meade probably made a good choice not to market the LX4 after evaluating their pre production models. But the impact on the existing competition was noticeable. And their advertising was certainly having an impact, as it grew to encompass several full color pages in each issue of the most popular astronomy magazines. We observed how Meade learned much about CCD camera technology from SBIG, even discussing a limited cooperation, only to later announce their own CCD systems that appeared to closely mimic those of SBIG. The Meade CCD systems took more than one year to come to market after being announced, they were horribly buggy, and were all the while advertised in such a way that many amateurs did not buy SBIG for the time while they waited to see the long awaited Meade CCD systems. Keep in mind that Company Seven is an SBIG retailer (the first, and for a long time the only!) and we had great respect for these products and their innovative President Richard Schwartz. We are a TeleVue retailer and we hold Al Nagler high on a pedestal. And we had started to gain respect again for Celestron when Alan Hale came back to manage the company for the Swiss owners in 1986. So to see animosity develop in our community among those whom we though could work together was difficult. Big Brother Steps In - Thank You We came to better appreciate the value to the astronomy community of having healthy and competent competitors in the industry when in 1991 it was revealed that there was some discussion between Meade's parent (Harbour Group Investments, L.P.) and Celestron's owner Diethelm Holding Ltd. of Switzerland about Meade acquiring Celestron. Company Seven was among those who testified to the U.S. Federal Trade Commission that neither company was treating its customers as well as they could recently, and if they became a monopoly in the SCT market there was no reason to believe altruism would become their byword. The Commission gave final approval to a consent agreement settling charges that the proposed joint venture between Meade and Celestron would have created a virtual monopoly in the manufacture and sale of mid-size Schmidt-Cassegrain telescopes - one of the same product markets at issue in that present matter. The agreement placed a 10 year requirement on Harbour Group and Diethelm to obtain FTC approval before acquiring any company that manufactures or sells Schmidt-Cassegrain telescopes in the United States. The consent agreement followed a decision by the U.S. District Court for the District of Columbia granting the Commission's motion for a preliminary injunction barring the acquisition of any assets or other interest in Celestron International by Harbour Group Investments, L.P. (Meade's parent), and further barring Diethelm Holding Ltd. (Celestron's parent) from acquiring any assets or other interest in Meade. Buy Low But by 1991 the astronomy community was in the post Reagan recession, and a Comet Halley hangover, and Meade Instruments under Harbor Group ownership was headed toward bankruptcy. In 1991 John Diebel bought Meade Instruments back from Harbour Group. John Diebel repurchased Meade Instruments for $510 (some say $1,000) and assumed $2 million in debt. John later was quoted as saying "I'm just not very good at taking orders from someone else. This is an entrepreneurial company, and I'm an entrepreneur." By late 1991 and into 1992, Company Seven observed how Meade was growing and becoming innovative on its own again. In 1992 Meade also instituted new dealer policies establishing the "Advanced Systems Retailer", and to their credit one of the first "MAP" minimum advertised price policy. By the time of Comet Halley the competition and price discounting for sales (particularly by mail order oriented camera stores) had by the 1990's destroyed most specialty camera stores, and now was having its impact in the astronomy community. The competition from mail order oriented stores, particularly in New York (where the businesses are often subsidized) become so virulent that it became difficult to find a showroom such as Company Seven where a customer could evaluate products and obtain competent advice. As more customers bought from mail order houses, the smaller local specialty shops either reduced their selection or closed completely. Over time, customers found they had to buy from one of fewer and fewer mail order oriented houses - most of whom operate on such small profit margins that they can not retain helpful staff, and a number of whom did not always deliver complete products for the prices they advertised. Manufacturers found over time that fewer and fewer stores, mostly mail order, were accounting for a higher percent of sales that were made. But sales numbers overall were spiraling downward since mail order houses really do not actually generate the new sales by advertising a product or showing it. In response to these market changes Meade and others including TeleVue, Leica, Carl Zeiss established a "Minimum Price" policy. The M.A.P. provides a profit margin, usually of about ten or fifteen percent. It is thought that if most or all merchants comply, then this policy then this should encourage a greater number of regional stores to display the products. The MAP prices are lower than Suggested Retail however, retailers are free to offer product at any price. Company Seven agrees this policy can serve the consumer best in the long run and so we generally sell at "MAP". C-7 and Meade part...for a while But by 1992 Company Seven the recent several years history at Meade had grated on us. We had basically lost confidence in Meade management's direction; their focus did not seem to coincide with our small business mentality. We operated with some concern of malicious litigation from Meade after all we had observed Meade's involvement with lawsuits including that against the late Roger Tuthill. Roger was one of the few surviving telescope retailers who could still include in his advertising "the astronomer's best friend", in years before his advertisements mentioned "even if you don't buy from me, buy Celestron". And we became more and more alarmed and frustrated as the quality control of those new Meade telescopes we received seemed to drop precipitously. Meade changes of policy it more and more difficult for us to obtain replacement telescopes for those that did not pass our Q.C. And repairs were now all to be directed back to Meade - at Meade's convenience, and at times with repair costs that we believed were not justified. This new repair policy at Meade was probably put into place in some measure to get "the monkey" off the back of retailers like Nature Company who did not have a clue about repairing a telescope or who simply wanted an out to avoid the costly responsibility associated with this customer support. Incidentally Nature Company like Energy Sciences, and Worlds of Wonder later went bankrupt as have most other similar chains that try to sell advanced telescopes. But ultimately Company Seven does not tolerate any manufacturer interfering with our customer relationships. And so in June 1992 when Meade demanded all retailers sign a new contract to stay on (with a some conditions we would not abide with), it became convenient for Company Seven simply not to sign on - we gave up our Meade products distributor status. Throughout the 1970's and 80's Meade Instruments continued to develop new and exciting telescopes for amateur astronomers. And in 1992 this culminated when they announced a revolutionary series of telescopes the Meade LX200 series of Schmidt-Cassegrain telescope. These "go-to" telescopes permitted amateur astronomers to push a button and direct a telescope to locate any object in the sky automatically. A real leap in technology, these were not the first to do so, but they were the most advanced, were relatively affordable, and available. The introduction of these telescopes was paralleled by Meade efforts to debug their computer control and drive systems which were probably rushed to market a bit too soon. The unusual 18 volt D.C. power requirements of the original LX-200, and the learning curve of such relatively capable telescopes in the hands of a novice was such that some good percentage of complaints and failures was probably attributable to operator error - these were not "customer proof" telescopes. Meade LX200 telescopes worked their way into almost every corner of the astronomy community. And by 1995 some startling results were being obtained with these telescopes in amateur hands and in professional observatories. Meade had been stung in 1992 by a few specialty telescope retailers including Company Seven electing to drop the product line. But in short time this would become more than offset by tremendous growth of their sales through new outlets including The Nature Company (later acquired by Discovery Channel Stores), Wal-Mart, Sam's Club, and Costco. By Fiscal Year 2002 Wal-Mart (including Sam's Club) would come to account for about 13% of Meade's net sales. By 1995 in virtually every country of the world where serious telescopes are sold, more Meade telescopes were sold than all competing telescope models combined. As we saw the astonishing growth of Meade, even in the face of the harshest criticism from some disappointed Meade customers, Company Seven realized that our protests had little impact on a company that had become worth a gazillion times more than us. Up to the 1990's Meade's dearest competitor Celestron retained the title as maker of the world's largest production Schmidt-Cassegrain telescope with their C-14. In fact when Celestron was at its unrivaled peak in the 1960's it did manufacture up to 22" aperture SCT. By the mid 1980's Celestron lacked the ability to make telescopes in house as large as their old 22", and no plans were on the horizon for telescopes larger than their C-14. 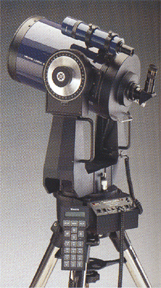 By 1993 the pressure from new Meade products, and their astute marketing was already taking its toll on all competitors including Celestron when in 1994 Meade surprised the astronomy community by announcing a new large aperture Schmidt-Cassegrain telescope - the 16" LX 200 telescope. This 318 lb. (144.6 kg) fork mounted behemoth (OTA alone 125 lbs. / 56.8 kg) provides about a 50% increase in light gathering power over the C-14 of Celestron. Now regardless of claims of optical superiority by Celestron, the aperture difference was beginning to matter. With the 16" LX200 Meade became and apparently remains King of the SCT's. 1996 found Meade hitting it right in another area opposite that of the 16" LX 200. This was due to the the introduction in 1996 of the Meade ETX 90 which became enormously successful, a simple to use compact telescope. Thousands of newcomers flocked to astronomy - it is as if the ETX 90 had become the "VW Bug" to budding astronomers of the late 1990's. This telescope incorporates 90 mm aperture Maksutov-Cassegrain optical design, characterized by relatively sharp and clear images, and a high degree of resistance to shock and vibration. This is among the traits that made this telescope so attractive for viewing bright distinctive targets (planets, moon, birds), and within one year this became the largest volume modern telescope ever sold. We observed how even experienced amateur astronomers might buy an ETX just to have an economical, quick set up and go telescope. The quality of optical installation, manufacture, and its overall mechanics was probably superior to that found on most department store telescopes. But Company Seven did speak with several of the more experienced observers who might buy half a dozen or more ETX's one at a time, testing and then returning each to the local chain store until they could find one ETX that they observed would provide image quality superior to the previous models. It is probable that too many of this class of observer who bought the ETX were expecting too much in a $500 telescope. We wonder if this is among those reasons why many of the mall stores met their demise. But we were left wondering how much better could the telescope be if Meade put in another $100 or so in production? And yet, many who were happy with their ETX eventually showed up at Company Seven eager to move up to their second larger telescope. John Diebels' vision of getting more people interested in astronomy was working. Soon after the introduction of the original ETX, John Diebel developed his idea of incorporating some form of computerized aid to celestial navigation on to his $595 ETX 90 telescope. He later said he was influenced to work in this direction while watching a television show about Microsoft and its founder Bill Gates. John was quoted as saying "I thought to myself, why can't we do something really revolutionary in this industry the way he did in his". That meant taking the computerized features of Meade's $15,000 telescopes and making them affordable for the masses. For Meade products used by children, the company's direction mobilized to provide superior optics (to traditional Department store alternatives) at competitive prices. Their literature promised "we at Meade Instruments want children to have an amazing experience - whether they are looking at Saturn's rings at 900 million miles away, the structure of a bird's feathers in their backyard, or the tiny universe in a drop of pond water. It took Meade engineers the next two years to figure out how to do it. Today, the company controls more than half the $230 million U.S. market for sales to amateur astronomers." Going Public In April 1997 John Diebel took Meade Instruments Corporation public with a stock offering. To this day Meade common stock is traded on the NASDAQ exchange with the symbol "MEAD". This public offering provided the funding necessary to put John's vision into production, and to pay for the pages and pages of color advertising in numerous magazines. John Diebel and the President of Meade and their Senior Vice-President of Sales have been with Meade for and average of more than twenty years each! They have seen the company grow, and learned much from their successes and setbacks. And as they remain among the largest Meade stock holders they understand the customers best interest very much remains their interest. By 1998 one could not buy a science oriented magazine without finding advertisements for the ETX. And one could not find a Mall where some store did not sell Meade featuring the ETX 90. Granted, the $595 ETX is no $5,000 Questar, even if Meade advertising initially implied that. But the ETX is lightweight and compact ("the best telescope is the one that gets used" Martin Cohen), and the "go to" computer control represented to many new buyers a way to get into astronomy without doing the work out of having to learn the night sky. Meade would need more than their 270 or so employees to meet the demands of the world for their telescopes. While Meade prospered, Celestron floundered under a chain of ownership changes over the past decade that led to their acquisition by Tasco, Inc. in 1998; this acquisition struck Company Seven as something akin to having the "Ford" automobile manufacturer acquired by a company that makes skate boards. And while Meade prospered with the innovative ETX their formerly superior competitor has been "Tasco-ized" into replying with some truly embarrassing "ETX clone" offerings. We know imitation is a since form of flattery, but when it is done so poorly it then becomes a comic tragedy. By the late 1990's Meade Instruments became recognized as another symbol of the success that is possible in America. And in 1998 its founder John C. Diebel, Ph.D., Chairman and Chief Executive Officer was recognized by the Franklin Institute with "The Bower Award For Business Leadership". The award testified to his leadership in making astronomy accessible and affordable to the public. He was cited for "his courage and insight, and leadership of a commercial venture founded on the premise of making astronomy accessible and affordable to the public. As an intellectual descendant of Benjamin Franklin, helping ordinary people experience the discipline, wonder and excitement of scientific inquiry. Mr. Diebel's efforts support science and technology literacy among the populace - the mission of The Franklin Institute." This award put John Diebel among pretty accomplished people. As nice as all that sounds, and as pretty as the medal is, we mere mortals noted the Business Award confers no cash prize. By 1999 Meade had grown to about 340 employees. John Diebel could begin to grasp the fact that Meade had won and there seemed little else to worry about. In July 1999 the Astronomical League "President's Award" was presented by Chuck Allen to John C. Diebel. This is a special award presented from only a few times (up to 2002) by the Astronomical League to people who have contributed greatly to amateur astronomy and/or the Astronomical League, but who do not fit into any of the other award categories. These awards are administered by the President with the advise of the Executive Committee. Johns award was presented "as a way to give back to Meade what Meade has given to the Astronomical League and the astronomical community through their support of Astronomical League programs for many years." Nice plaque - but again, we don't believe any cash went with is. While all this sounded great, Company Seven began to grasp the good times of the consumer telescope market would be over for a while. In December 1999 we read a financial magazine article that listed Meade Instruments among the fastest growing public corporations in the USA. The article implied Meade stock would be a good investment - yeah, like now is the time to buy a stock as it approached its all time peak. To us that was one of the signs that a market adjustment was due, more so since Company Seven had sensed a slowdown in the economy. We had also observed the recent decline and fall (if not chaotic bankruptcy) of several peers and competitors in the astronomy community, and we were aware of the weakness of some others who remained. How could all of these failures, with the millions it must have cost suppliers (and consumers who lost deposits), be a good sign in the economy? We also observed the technology stocks climbing at an unprecedented pace ("irrational exuberance" per Alan Greenspan), one fund grew in value by 40 to 80 percent for the prior few years culminating in a growth of 86 percent from December 1999 to March 2000! This was all enough to make us run and duck for cover. The stock market crash beginning in 2000 (okay "adjustment" if it makes you feel better), combined with the losses from failures by some of its vendors, the general malaise and uncertain economy under President Bush (like father like son?) turned the telescope market upside down. We were used to seeing mall chain stores go bankrupt over the past tewenty years or so. But several prominent telescope specialty retailers had failed in recent years including Dan Gordon's "Spectra Astro Systems", and Mark Tracy's "LA Optical". Then in 2001 Glenn Jacobs "Pocono Mountain Optics" failed, one of the the largest mail order oriented telescope houses, and a Meade retailer. These failures and those of the mall store chains "Nature Company" and "Worlds of Wonder" were not all the fault of the economy but they certainly cost Meade and other manufacturers real money. And these bankruptcies also resulted in consumers who were irate at having lost deposits, and were growing frustrating sensing that fewer and fewer telescope specialty stores remained. The loss of long term telescope specialist "Lumicon" in September 2002 compound the sense of malaise in the market, and it left Company Seven wondering why had the more competent and better intentioned stores failed when shrewd business minded shops prospered - even when they were not all that well regarded by their own customers? By 28 May 2002 others would fade from the picture too. The owner of Celestron came crashing down when Tasco Worldwide began the process of liquidating after failing to service debts to its secured lenders. And not missing a beat, on May 29, 2002 the U.S. Federal Trade Commission sought a temporary restraining order and a preliminary injunction in federal district court to pre-empt any attempt by Meade Instruments Corporation to purchase all, or certain assets, of Tasco Holdings, Inc.'s Celestron International. According to the FTC's complaint, an acquisition by Meade of Celestron assets would impact adversely the performance telescope market by eliminating substantial actual competition between the two companies, and by creating a monopoly in the market for Schmidt-Cassegrain telescopes. This effort, and that ruling of 1991 by the FTC mentioned above, was enough to discourage any attempt by Meade to pursue the matter further. Meade Today By the turn of the millennium telescope sales accounted for about eighty five percent of Meade Instrument's business. Of those, sales to all amateur astronomers represented some sixty percent of these sales. Of this the entry level refracting and reflecting telescopes (at least meeting the dictionary definition of "telescope") accounted for 59% of sales for Meade in Fiscal Year 2002, and for 98% of shipped telescope units. These less expensive 60 mm to 114 mm telescopes are distributed by specialty retailers generally on a semi-exclusive basis. Meade is a major supplier of these types of telescopes to retailers such as Discovery Channel Stores, Wal-Mart, Sam's Club, and Costco. In Fiscal Year 2002, Wal-Mart (including Sam's Club) alone accounted for 13% of net Meade sales. 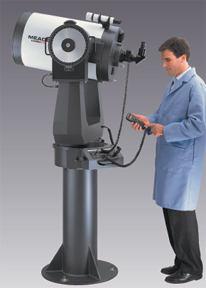 Meade offers approximately 250 accessory products (12% of Fiscal year 2002 sales). Meade also offers a line of binoculars made overseas to their specification (11%), and industrial optical and digital imaging products. Meade also markets a full range of binoculars and biological microscopes, including CaptureView, a binocular with a built-in digital camera introduced in February 2003. As of the first half of Fiscal year 2003, sales of CaptureView alone represented 14% of total net sales, compare this to the FY 2002 2% that the entire binoculars and biological microscopes accounted for previously. The more advanced astronomical telescopes accounted for only 2% of shipped telescope units, and 16% of sales in fiscal year 2002. More sophisticated telescope products include the LX series Schmidt-Cassegrain and Maksutov-Cassegrain telescopes, which are more in line with the quality and performance which Company Seven offers. It is a wonder that Meade has invested so much research and development effort in their better telescopes when the bigger profits are made in the opposite end of the performance spectrum. But successful corporations often spend on R&D hoping it may translate into new products, or product improvements that were not foreseen. On 25 October 2002, Alliant Techsystems (ATK) agreed to sell Simmons Outdoor Corporation to Meade Instruments Corp. in an all cash transaction. ATK sold Simmons for about $20.8 million! The Simmons acquisition gives Meade an immediate in to a riflescope market that Meade estimates is worth about $150 million at wholesale. This adds Riflescopes to the Meade inventory for the first time. "This acquisition is a watershed event in the history of our company and positions us well to compete in the $300 million sports optics market," Diebel commented. "Our purchase of Simmons should firmly establish Meade in the riflescope market and should also significantly expand our opportunities in the $175 million binocular market, one in which we have an emerging presence. Meade stated the acquisition could add as much as $40 million in revenue, and between $3 to $4 million in pretax profits to Meade's bottom line in the next fiscal year. By 2003 Meade employment was listed as being up to 450. Meade personnel hold 39.26% of the company with John Diebel now controlling about 16% of Meade Instruments 19.8 million outstanding shares. The shares peaked in value in April 2000 at about $39.50 per share, and three years later hover at almost $3.00 per share. An engineer, John Diebel still devotes about 40% of his time to research and development, we'd bet he can afford to put the other 60% into golfing . C-7 On Again Since the parting with Meade in 1992 Company Seven went on to further establish its credibility in the marketplace. By concentrating on custom Government and industrial work, Company Seven could subsidize as needed a highly regarded showroom and continue to operate it in an idealistic manner, even in the more difficult economic times. Our showroom remains advanced in content, and our staff excels in ethics and competence. But the giving up of the Meade product line in 1992 was recalled as a sad day at Company Seven, we interrupted friendships and we gave up access to some products which our customers would have liked to buy here. Over the 1990's we referred customers who wanted Meade product to other shops who we thought might be similarly experienced and share our ethic only to get back reports of problems more often than we'd like. Over the years we heard people tell us "I will buy a Meade, but only of I can buy it from you". Over the years since 1992 we have come across some pretty impressive Meade telescopes. We noted how a good Meade 8" SCT could now really hold its own in the views and the mechanical performance. We saw some Meade 12" SCT's that made us want one, even if through most of the 1990's we remained concerned about the reliability of any consumer oriented "go to" telescope. We also had come to appreciate how much technology Meade had provided to the community. Among the most striking examples to our staff of what our customers were missing is the following image which was published world wide; it remains a source of much amazement in the astronomy community - not to mention the stir it caused among the defense and intelligence communities! In December of 2001 a Vice President from Meade Instruments visited our Laurel, Maryland showroom. We knew him as far back as the early 1980's, and it was nice to reminisce about old times. The staff at Company Seven had come to believe some of our at times insensitive critical comments about Meade quality control and customer service made in the past had not only "burned the bridge", but had probably also removed the foundation and filled the holes with sand. Company Seven was probably considered anathema, and Martin Cohens photo was probably on the corporate dart board at Meade. But by 2001 we all seemed a bit older, wiser, and more able to talk about any concerns or differences in our business philosophies. By 2002 we made a greater effort to speak with any Meade telescope owners we met to evaluate their experiences. Some of them were not happy with Meade, yet more and more of whom we spoke with were happy with their telescopes. We even met one fellow who curses his Meade LX200 telescope almost every night out, and yet he will not part with it...go figure. However, it became clear to us that Meade's LX200 GPS telescope technology was superior to that we could offer, it had superior platforms (tripod, wegde, etc.) supporting the telescope, and it was more accurate in its set up procedure. And Meade overall, had developed a system of telescopes that had a very good selection of accessories suitable not only for Meade telescopes, but for others as well. While some of the accessories just served to fill a gap that others might or might not address, some of the Meade accessories were highly innovative. Consider the Meade Model 1220 Field De-Roatator. Meade LX200 telescopes may be operated in the altazimuth mode (i.e., Fork Mount attached directly to a Field Tripod or Pier without polar alignment) for all visual applications and for photographic or CCD imaging exposures of up to about five minutes duration. The majority of LX200 operators use their telescopes in this Alt-Azimuth configuration. However, any telescope tracking in the Alt-Az position during longer exposures will produce images that show those stars at the edge of the field appearing to roate about the center. Even if a guide star is perfectly maintained in a guiding eyepiece or CCD autoguider, stars away from the center of the field appear as small concentric arcs instead of pinpoints. This problem can be solved by attaching the Fork Mount into an Equatorial Pole Aligned arrangement by the use of an optional "Equatorial Wedge". But for some this is costly, bulky to transport and may be quite a heavy accessory. So Meade developed the industry's first Field De-Roatator. Their Model 1220 cooperates with the computer controlled drive of the LX200 and rotates the attached camera at a precisely correct speed and direction thereby countering the effects of Field Rotation! Furthermore, Meade seemed more willing to respond to what the public demanded. When improved electronic focusers which attach to the telescope axial port came into the market, Meade added the capability to lock the Primary Mirror of their LX200 Schmidt-Cassegrain telescopes. To attain focus the Primary Mirror of production SCT's moves forward and backward along the telescope axis on an internal Baffle Tube. As the mirror is moved to attain focus, the focusing mechanisms tend to permit some mild degree of wobble or tilting of the mirror. Any modest movement of a mirror in this way can result in a shifting of the image left to right in the field of view, this is particularly a problem when the telescope is used with relatively small format CCD camera. In larger telescopes, the Primary Mirror may actually shift position slightly when the telescope mount slews from one part of the sky to another. By locking the Primary Mirror in place securely when the telescope is near infinity focus the pointing accuracy of a "Go To" mount system can be improved, this is particularly true of larger telescopes with more massive mirrors and greater effective focal lenths. And by using the fine electronic focusers (some of which atually compensate for ambient temperature changes! ), it is easier to achieve precise focuse. Company Seven came to the conclusion that either Meade or Celestron seemed equally capable of delivering a great or a lesser telescope; it would be up to us to find ways to evaluate what arrived. The deciding factor remains how the manufacturer will respond to our concerns. We have evaluated the new Meade Advanced Systems products and we conclude that Meade knows the future is uncertain in this economy, so they will continue to innovate while also working to improving what they offer now. Besides, aside from the usual lawsuits between Meade and Celestron, John Diebel had not sued Company Seven or at least threatened to sue for some years, maybe he too was mellowing. So after two years of on and off discussions, Company Seven is now a Meade Advanced Systems Retailer. We realize this puts a privilege and a responsibility in our hands, and so we and Meade will continue to work together to insure "purchased at Company Seven" remains positively meaningful.